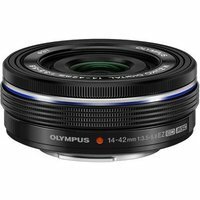 The Olympus 14-42mm f3.5-5.6 EZ M.ZUIKO lens in black with electronic zoom (EZ) perfectly complements the OM-D and PEN range in size, style and performance, delivering crisp, edge-to-edge quality throughout the entire zoom range. When attached to a compact system camera with built-in Wi-Fi users can control the 3x electronic zoom from a smartphone or tablet and view what the camera sees in Live View mode, which is particularly useful for capturing group family portraits at special events. At the wide end of the focal length the lens offers a minimum focusing distance of 20cm making it great for close-up portraits and dynamic nature shots. Suitable for everyday picture taking, the extremely lightweight (93g) 14-42mm EZ lens with quiet autofocus zoom operation can be adjusted manually for smooth, precise control.